In 2007, for the first time, ASAO has awarded a Grant to Return Indigenous Knowledge to Pacific Islands Communities or "GRIKPIC". The 2007 GRIKPIC grant, for $1000, was awarded to Dr. Haidy Geismar, to help underwrite the publication of a Bislama-language publication, John Layard Long Malakula 1914-1915. At 100 pages, this is a substantial and attractive publication which we are proud to have supported. It includes beautiful reproductions of nearly 150 of Layard's original photographs, together with Bislama translations of his captions, and essays by Anita Herle, Haidy Geismar, and Numa Fred Longga. Mr. Longga is the Curator of the Malakula Kaljoral Senta. 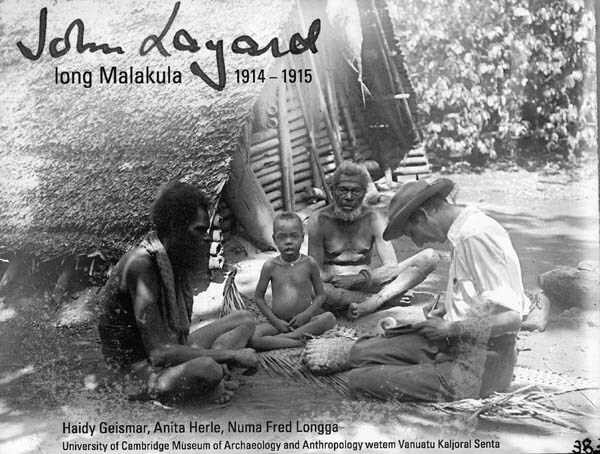 Anita Herle writes in the preface, "It is hoped that their presentation and the translation of Layard's original captions into Bislama will enable the images and associated documentation to be readily accessible to ni-Vanuatu and the Malakulan communities from which they originated." 1000 copies of the book have been printed and will be made available to schools and other educational organizations in Vanuatu.